3. Customised Course on Parliamentary Procedure for Officers of Autonomous Bodies/Institutes/PSUs under Central Govt. 4. 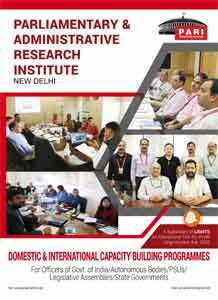 Customised Course on Parliamentary Administration for Officers of State Assemblies/UTs..
5. Customised Course for Protocol Officers in States Government. 6. Exclusive Course on Committee on Official Languages ( Raj Bhasha Samiti, Ministry of Home Affairs) for Officers of Autonomous Bodies/PSUs/ Ministries.